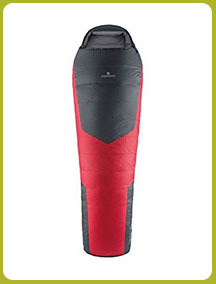 Difficulty: the heat in summer could be the main difficulty. The considerable loss in altitude compared to earlier stages, and the ever increasing influence of the Mediterranean climate, are evident. Water: you will find a few points where you can fill up with water, such as Can Serra, Beget, at the approach to Pla de la Plantada or Talaixà. 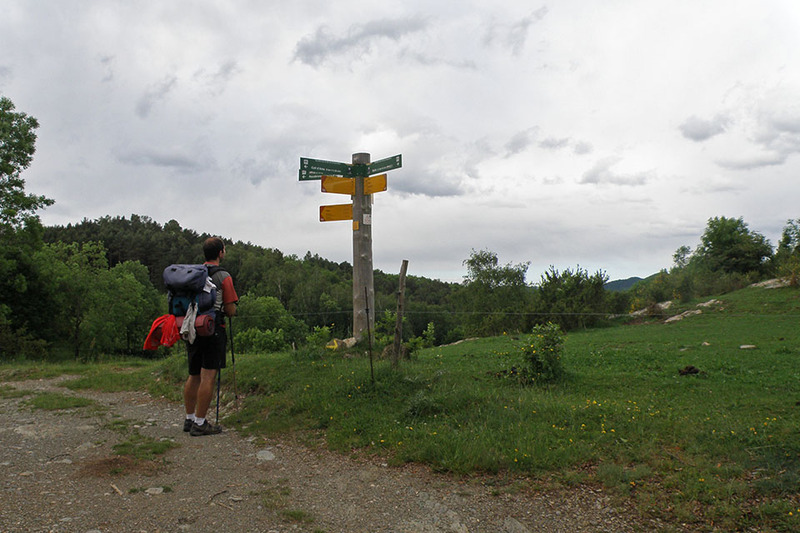 (0h40min; 2,4 kms) Collet de la Costa (1.172m) a signpost indicates the different routes that pass this way. 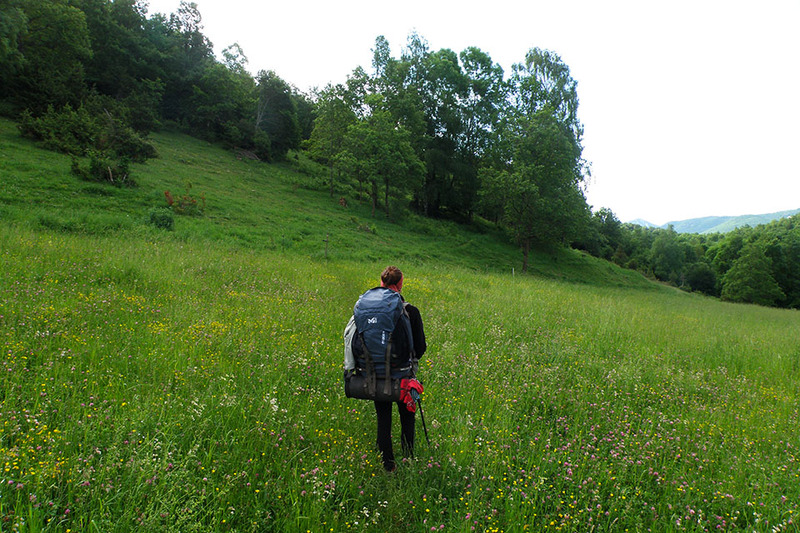 You go right, through fields and small rises and falls, as far as a col that is crossed by a track. 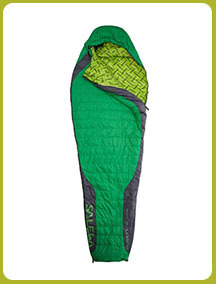 Pay no attention to it and keep ahead, past a field surrounded by a fence (well waymarked). 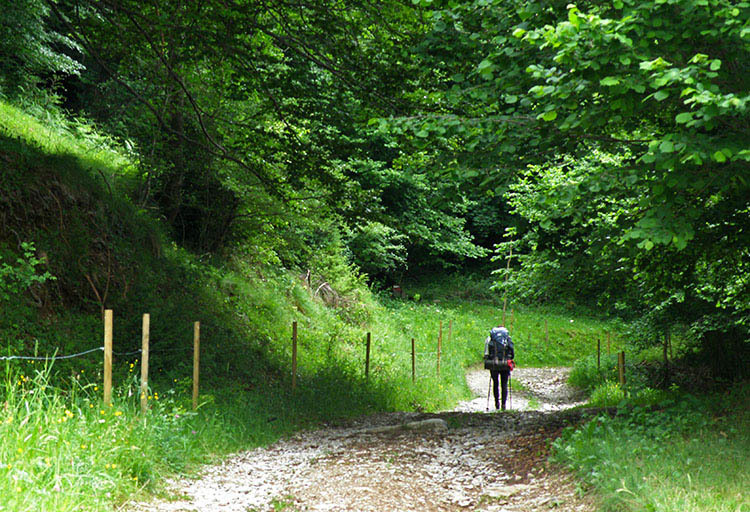 This section of path is very pleasant, passing woods, fields and houses. (1h20min; 4,5 kms) Coll de la Boixeda (GIV - 5231 road) (1.095m). On the other side of the road there is a rest area, a panoramic view point, a couple of seats, waste bins and several post boxes. Pay no attention to the path below (left) and keep an eye out for the markings that lead you across the field opposite. A steep drop heads down to Can Serra where there is a drinking fountain in the porchway of a house. 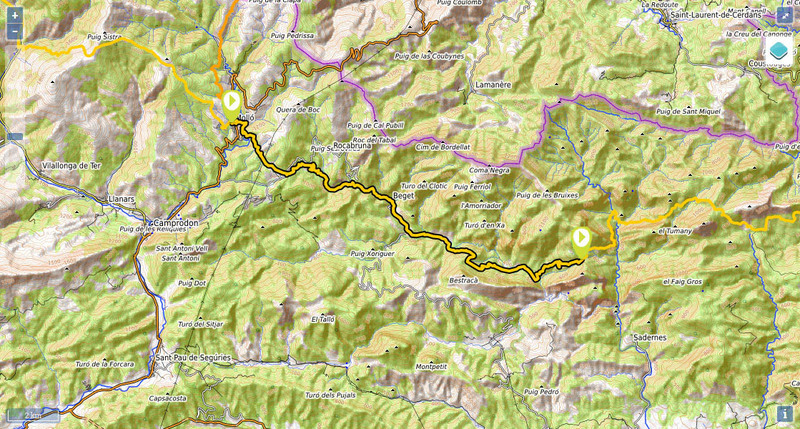 A little bit further on you reach Casa Etxalde, which can be reached by a track. Follow it for 500m as far as a tight bend on the left (the track climbs up to the nearby road), where you take a rather unclear path going straight ahead across a field. Pay attention here to the turn it takes to the right. The path now heads into woodland, joins a track and passes Can Planes, where shortly afterwards (100m), you take a path that descends to the right, to Molí d'en Sorolla. A sign announces that you are now in the Alta Garrotxa area. 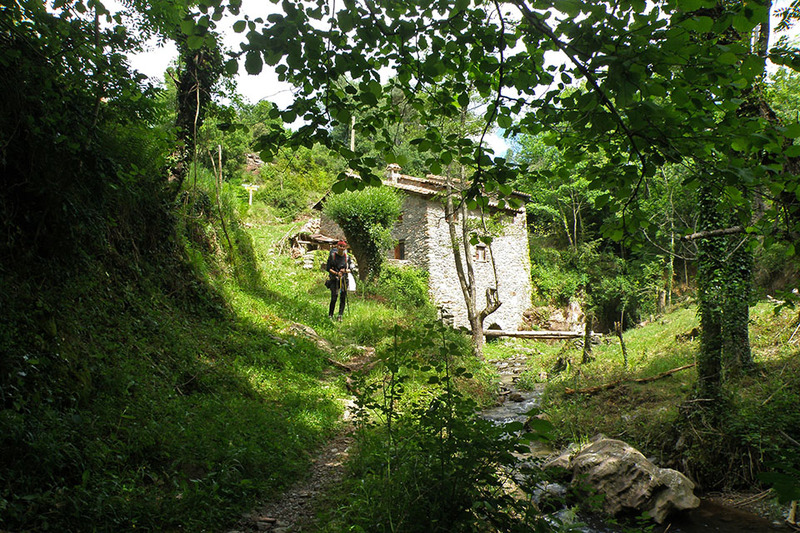 You leave the old mill on your left and cross the stream (Riera de Rocabruna). 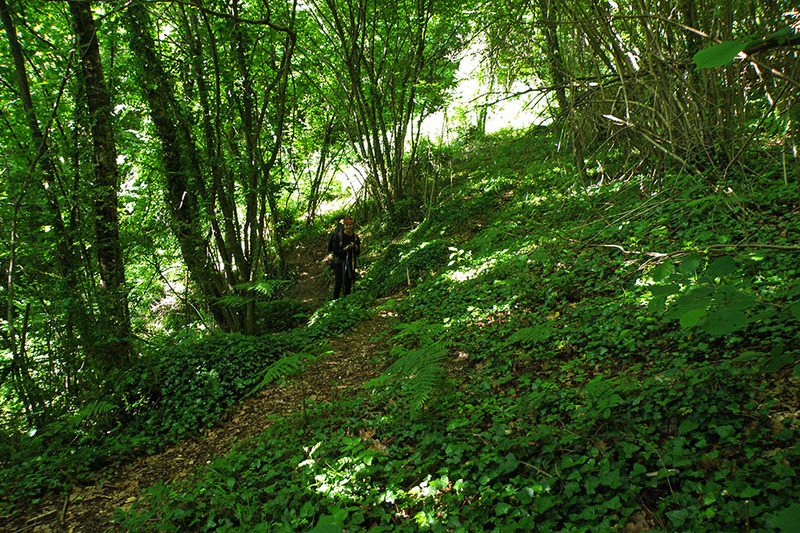 The path continues through woodland, which increasingly takes on the Mediterranean influence, skirting the south slope of the Turó del Castell (1,000m), where the ruins of Rocabruna castle stand. You pass a few buildings in ruins and rejoin the road. 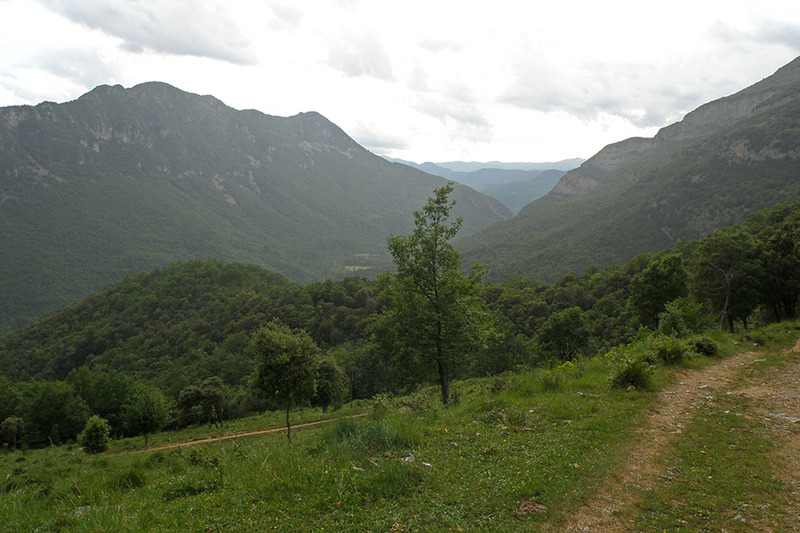 Follow it for a few metres to the left, then continue again through dense woodland, next to the Riera de Beget. 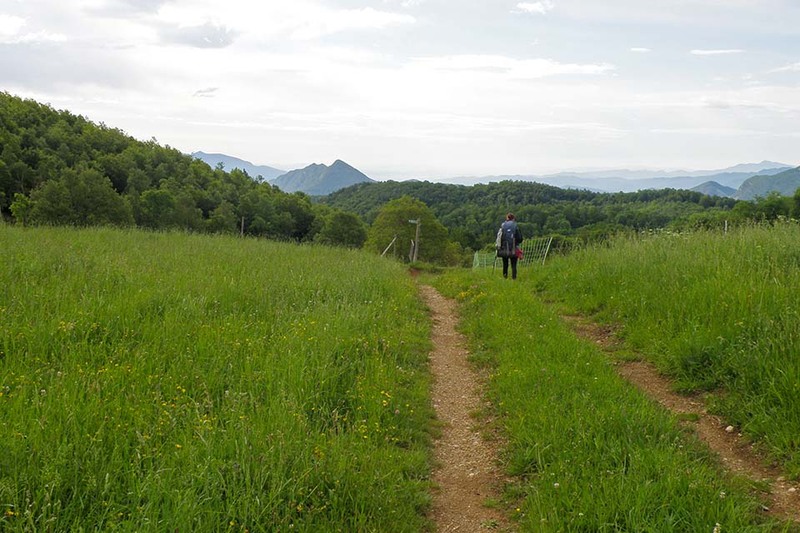 One kilometer further on, the GR11 comes back out at the road, which you follow for half a kilometre, before taking a steep path that takes you to Beget. 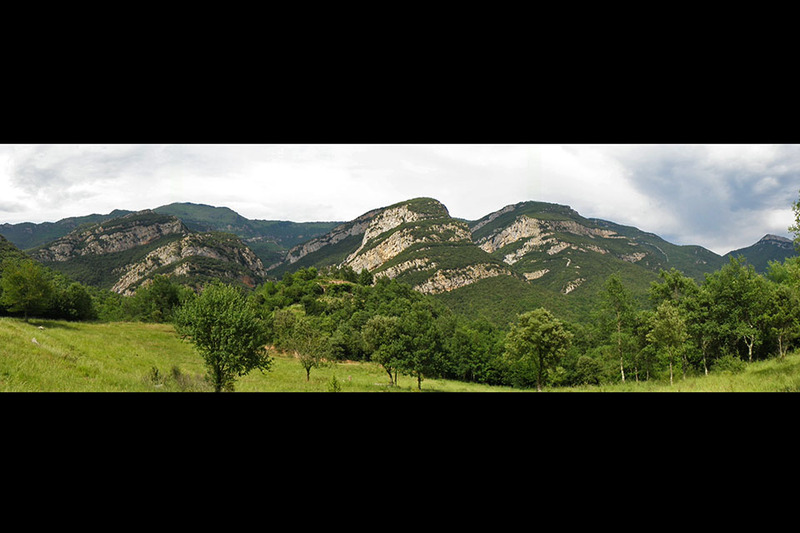 (3h15min; 14,5 kms) La Farga (446m). 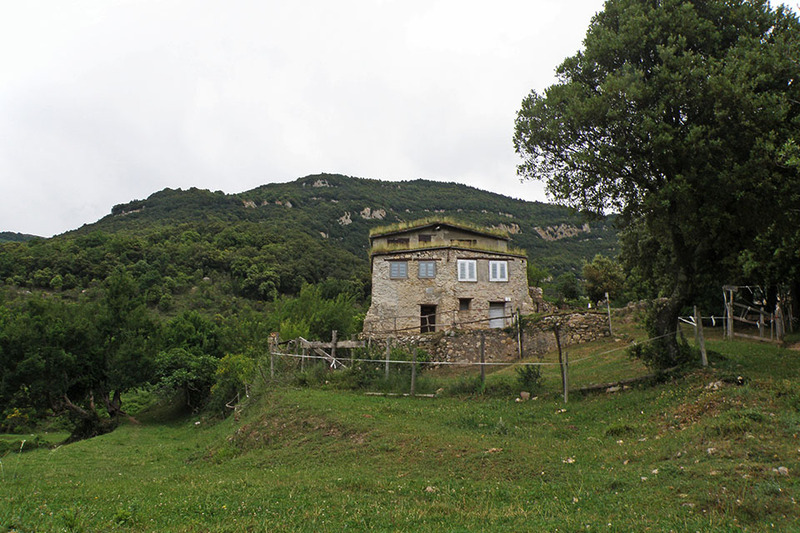 This is an abandoned farmhouse which marks the end of the track, and you embark on a sharp climb up a path, through dense woodland, to Coll dels Mulls (700m). On the way up you will find the odd abandoned house (Les Feixanes) and a few more on the way down, close to Coll Joell (502m), where the path gives way to a track (shortly after passing a stream) that ends up heading gently downhill along the river. At the end of this section, you will pass a covered structure with tables (private property) and a little further on, a drinking fountain. (4h55min; 19,9 kms) Pla de la Plantada (362m). The red and white markings abandon the path going to Oix via Salt Liberals pass, and lead you across the river over a narrow walkway. 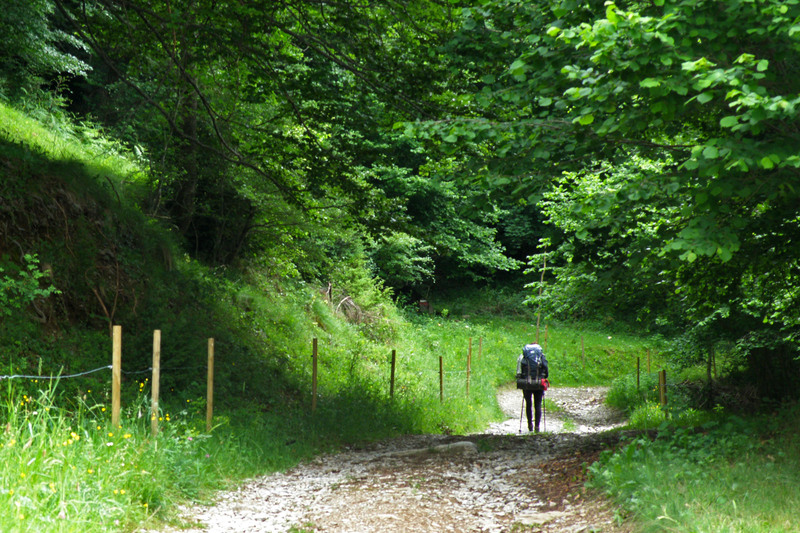 The ascent to Talaixà begins here, mostly along a path, but with some short sections of track. (6h00min; 23 kms) Talaixà (735m). Free shelter and abandoned village. Next to the shelter there is a drinking fountain. The water comes from a deposit that stores the scarce supply from the fountain, together with rainwater. The water is treated with bleach, although as you can read on the fountain, it carries no health guarantee. 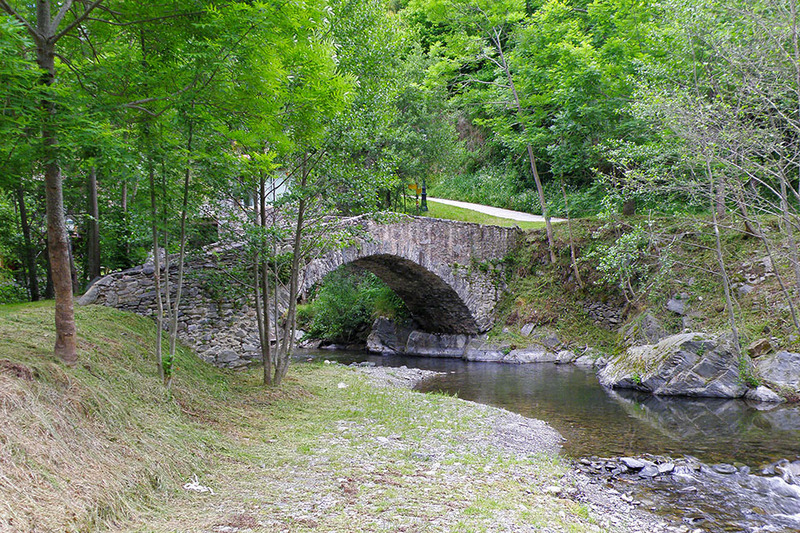 At the beginning of the stage, in Molló: Hotel Calitxo and Apartamentos Calitxo. 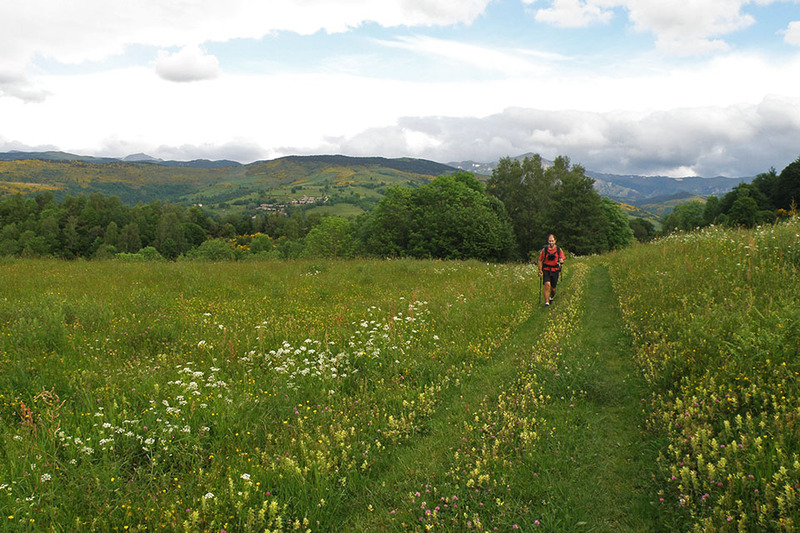 On the climb to Collet de la Costa, 20 minutes from Molló, Casa Rural La Costa has rooms for 2 people. During the stage, in Beget: Hostal El Forn. In Molló there is a grocery store and the odd bar. 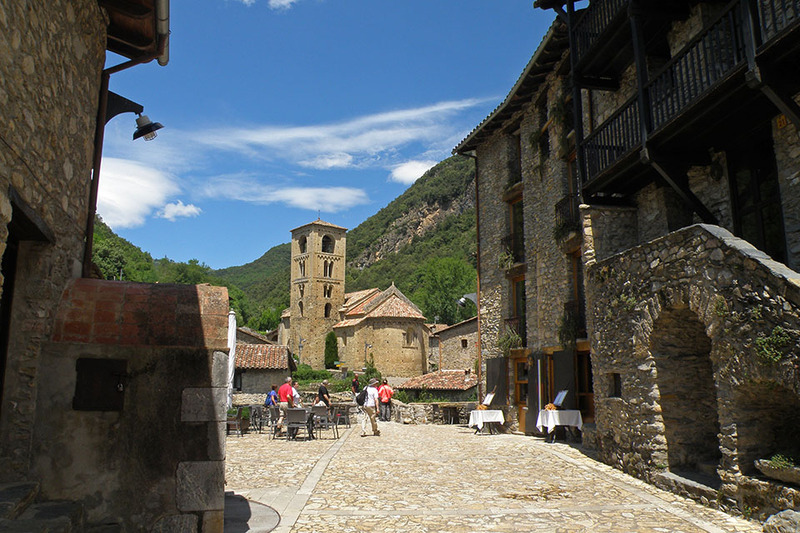 In Beget there are several bars/restaurants, but there is nowhere to do any shopping. Prados cerca del collet de la Costa.